During my winter break, I went traveling in my home country China. My trips to Beijing and Huangshan gave me the opportunity to take photos and record the beauty. Beijing, as the capital of China, has always been the combination of modernity and traditions. Having lots of historical attractions and tasty food, it is no doubt a wonderful city to visit, and has been one of my favorite places back home. Such Beijing traditional snacks are called Bingtang Hulu. Usually made with syrup-covered hawthorn fruits on a wooden stick, some new ingredients have been introduced to this traditional method of candy-making as a result of modern importation: besides hawthorn fruit, citizens of Beijing may also enjoy syrup-drenched strawberries, grapes, or even cherries. They are one of my favorite childhood snacks, but I haven’t had them for years. During the trip to Beijing, I re-encountered Bingtang Hulu, and they triggered my childhood memories involving the sweet snacks. Peking roasted duck, another traditional cuisine, is one of the “must-eats” when you go to Beijing. In this photo, the ducks are hung under the shop sign, and there are multiple other snacks and food being sold, such as Baozi (steamed bun), Shumai, and hot pear juice. I intentionally darkened the wall and formed the contrast between the tree and the wall. I really liked the colorful coating on the tree branches, which gives me a sense of warmth in a freezing winter day. 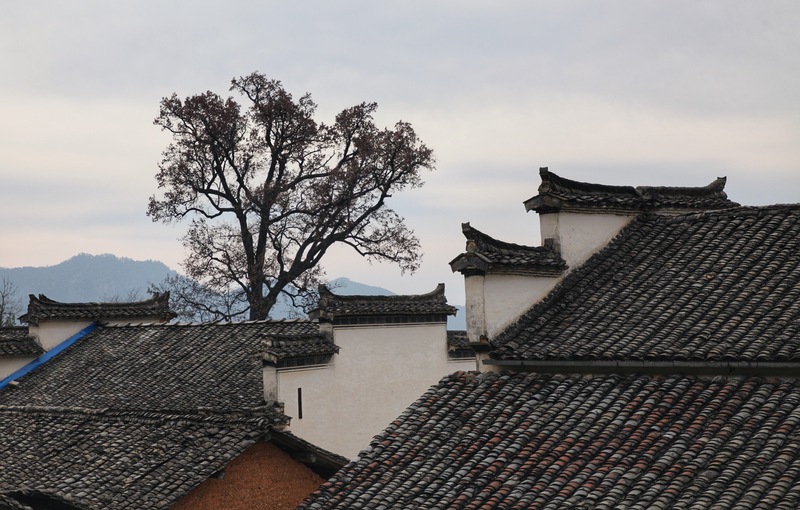 After the trip to Beijing, I went to Huangshan, my father’s hometown, which is a tiny mountain village in Southeast China. 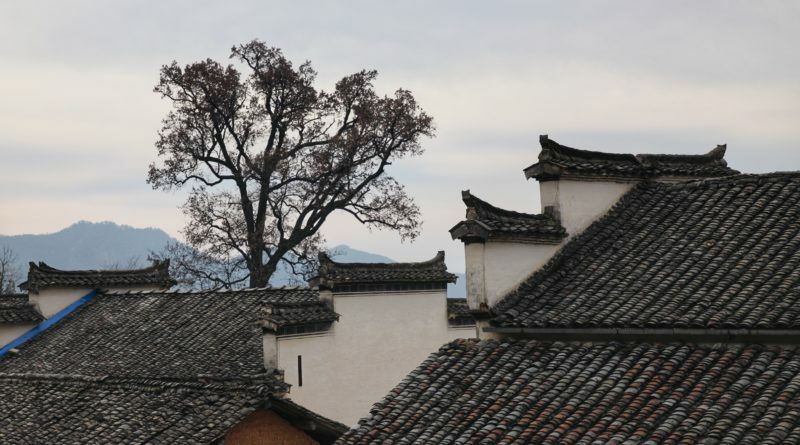 This is a photo of one of the villages next to Huangshan. Architectures around that area have such styles of tiled roof and white wall, which beautifully coexist with the mountains and woods surrounding them. When I took this photo, I was standing on a higher place overlooking the village, and this scenery conveys a sense of serenity to me. This was also taken from the same place as the previous photo. The village I visited is famous for its tea garden, and these rows of plants are actually tea leaves. The man on the right is a local peasant, and he was talking to my grandmother when I quickly took the photo. This was taken at the same position. An old man was walking among the tea garden, forming a harmonious spatial relationship with the houses at front. Villages like this always calm me, and are definitely good places to meditate. I sincerely love this place, where I can have the opportunity to contemplate on my life. Villagers are as welcoming as families, and the village itself is a nearly secluded shelter.